One of the things we have taken away from our time spent at the Miele ‘Taste for Design’ cooking courses, is just how easy it is to re-create exceptional food when using the Miele vacuum sealer and the steam oven to create ‘Sous Vide’ recipes. For those of you not yet familiar with the term, Sous-vide translates to the French for ‘under vacuum’ and is a method of cooking in which food is first vacuum-sealed and then placed in a water bath or in a temperature-controlled steam environment. The meat is cooked very slowly at consistent low temperatures which means that moisture is retained, ensuring that the meat is exceptionally tender and juicy. Because the cooking process involves a constant and specific core temperature, it is impossible to overcook your food and the cooking results can always be reproduced. Sous-vide cooking can be used to create exceptional vegetables, eggs and meat and is a fail-safe way to create the perfect steak every time- guaranteed without fail. 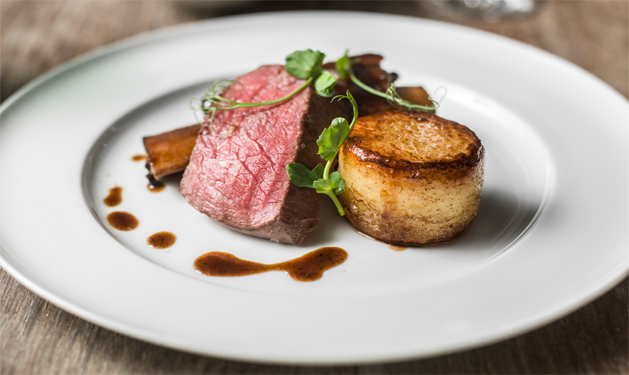 There were so many recipe options to choose from when trying to choose our favourite one to share, however we have gone for the beef as it really is the perfect test to prove just how simple it is to achieve chef-like results. The following recipe has been taken from the Miele website. A steam oven and a vacuum sealer drawer are required in order to recreate this recipe. Preheat a Miele multi-purpose casserole dish on the hob. Add a little vegetable oil and pan fry the beef ribs, celery, red onion, carrot, bay leaf and balsamic vinegar until browned and caramelised. Add enough of the beef stock to cover the ribs and bring to the boil. Cover the casserole dish. Transfer to the Miele Steam oven. Steam at 100°C for 2½- 3 hours until the meat is just falling apart. Once cooked remove from the steam oven and allow to cool. For the fillet of beef, place the fillets into vacuum bags or food bags with 2-3 sprigs of thyme and freshly ground pepper in each. Vacuum or remove as much air as possible and place on shallow perforated steam trays. Put in the steam oven. Select cooking temperature according to preference for the finish of the beef. With half an hour remaining on the steaming time for the fillets, remove the ribs from the cooking liquor and set aside. Add the 2tbsp balsamic vinegar, brown sugar and port to the casserole dish. Bring to simmering point and allow to reduce to a sticky sauce or to preferred consistency. Season with salt and pepper to taste. Place the beef ribs into the reduced sauce to reheat. To complete the beef fillet, heat a large frying pan on the hob until smoking. Take the fillets from the steam oven and remove from the bags. Rub the beef fillets with a little oil and place into the preheat pan. Pan fry the steaks for 10-20 seconds on each side or until caramelised. Remove from the pan and leave to rest for a minute. Season with salt and pepper. Serve each fillet with a short rib, drizzle over the sticky balsamic glaze and accompany with seasonal vegetables. If you have not yet experienced cooking with a steam oven but would be interested in learning about the features and benefits, why not book onto one of the speciality courses on offer from Miele? The ‘Taste for Design – Just Steam’ course is an interactive experience day where a Miele Home Economist will show you just how versatile the steam oven really is and how it can revolutionise the way you cook. Alternatively, drop into one of our showrooms and a member of our design team will be happy to show you the extensive range of models on display and can guide you towards selecting the product that is right for you. To book onto an experience day or to organise a tour of one of our London or Bromham showrooms, please contact us on enq@mccarronandco.com.